Insulation: 120g Heatseeker Material: [shell] HyVent (2-layer), polyester plain weave, [lining] polyester fleece The Infant Boys' Toasty Toes Insulated Bunting uses the same protective features that The North Face uses for most of its ski jackets, so you know your pride and joy will stay nice and toasty this winter. Its fully taped HyVent shell provides waterproof protection that also comes in handy when he makes a mess, and Heatseeker insulation is sure to keep him warm whether he gets wet or not. 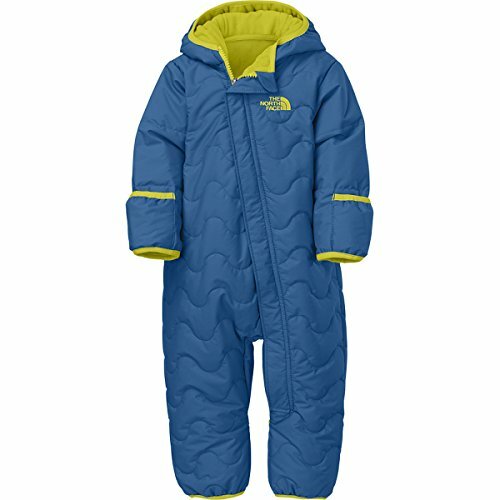 The North Face added a plush fleece lining that's soft against his skin, and the asymmetric front zip enhances his comfort. Fold-over mitts and booties make crawl-time a lot easier for him.